I am not really a breakfast person, and although I do love breakfast foods, I would prefer to enjoy them at dinner, or at brunch on Sunday. When we are traveling away from home though and head out to eat breakfast on the road, I always find myself choosing pancakes. 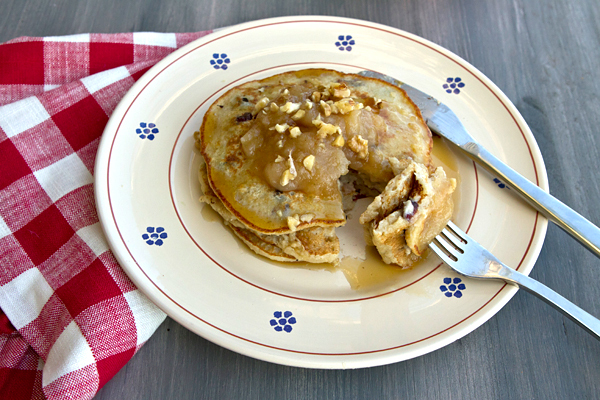 I love the flavor combinations you can create with pancakes, and never get tired of trying them. 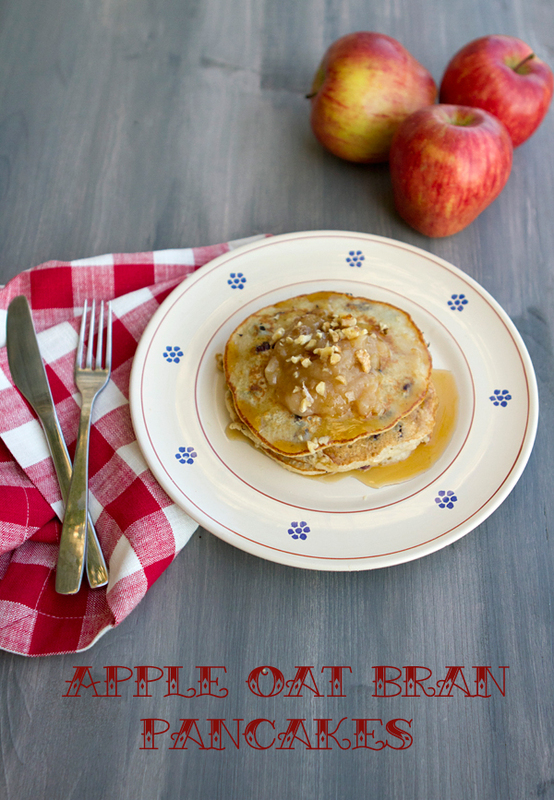 If I had to choose one favorite pancake flavor however, it would definitely be something with apples and cinnamon. I decided to make these pancakes using both my roasted applesauce as well as oat bran to increase the nutritional value, and included a good sprinkling of cinnamon in the batter as well. To serve, I added another dollop of applesauce, a sprinkling of chopped toasted walnuts, and just a drizzle of light maple syrup. By using applesauce to top your pancakes you’ll find you really do not need to use much if any maple syrup which helps to keep the calories down. Oats contain a good amount of protein, are high in fiber, and rich in thiamine, folate, B5, iron, magnesium, zinc, copper, and manganese. Walnuts are a good source of protein and are rich in phytosterols which help to lower cholesterol. Also rich in fiber and vitamin E.
Apples are known for their impressive list of phtyto-nutrients, anti-oxidants, and soluble fiber. In a bowl, mix together the flour, oat bran, sugar, baking powder, salt, and cinnamon. In a separate bowl, mix together the egg, milk, and applesauce. Mix the wet ingredients into the dry just until combined. Stir in the raisins or cranberries if using. Lightly spray a nonstick skillet with the cooking oil spray and pour in about 1/3 cup of the batter for each pancake. Cook for 1 1/2 to 2 minutes or until the top bubbles, then turn and cook the other side. Amazing healthy treat! Thank you so much for this recipe!